GE provides a variety of distribution automation solutions that enable fast, accurate monitoring and control of distribution assets to maximize grid efficiency and reliability. Our solutions for distribution automation include intelligent line monitoring systems, recloser controllers, field RTUs and substation based FDIR/FLISR solutions. These solutions fulfil the need for embedded grid intelligence by providing advanced protection, monitoring, control of low and medium voltage distribution feeders. 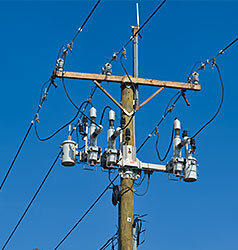 Our substation based fault detection, isolation, and restoration systems are designed to increase the reliability of distribution utility networks. With the ability to monitor and control reclosers and switches, these systems can restore un-faulted sections of network, and therefore improve utility reliability indices and customer satisfaction. Multilin Intelligent Line Monitoring System The Multilin™ Intelligent Line Monitoring System is a complete solution for improving the reliability and efficiency of overhead networks. The Line Monitoring System is modular, accurate, reliable, cost effective and easy to install. It enables Utilities to remotely manage and optimize their distribution assets while minimizing outages and disruption to customer supply. 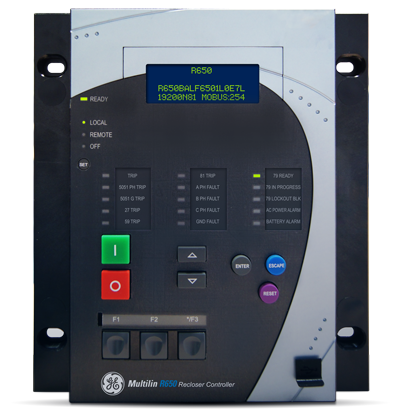 R650 Recloser Controller for Distribution Networks The Multilin R650 offers a flexible solution for automatic protection and remote operation on distribution networks. With its unique driving electronics module enabling true 4 shot auto reclosing and advanced logic programming, the R650 helps ensure network stability and efficiency. Multilin DGCM Field RTU Part of a platform of Distribution Automation Controllers, the Multilin DGCM Field RTU provides advanced monitoring of low and medium voltage distribution feeders and is suitable for both pole top and pad mounted switch devices or transformer feeders. As an integrated component to a FDIR system, the Multilin Field RTU provides the asset visibility utilities need to maximize system reliability. D400-DA Substation Based FDIR / FLISR Solution The D400-DA is a substation based Fault Detection, Isolation, and Restoration system, designed for improving the reliability of distribution utility networks. With the ability to monitor and control reclosers and switches, the D400-DA can restore unfaulted sections of network thereby improving utility reliability indices and customer satisfaction. Feeder Recloser Protection Systems (URC) Reliable reclosing system for distribution feeders. The Multilin Feeder Recloser Protection Systems is designed to provide distribution feeder protection, control, monitoring and metering in one integrated package incorporating the high end features of the F35, F650 or F60 feeder management relays. Not finding the distribution automation product that you’re looking for? View legacy distribution automation products.